EDINBURG — Everything went as planned for No. 9 Edcouch-Elsa through three quarters. The Yellow Jackets confused the No. 5 ranked Edinburg Vela SaberCats defense by alternating their quarterbacks and hitching the offense to the reliable legs of senior running back Jorge Gomez. But a fourth-quarter turnover turned out to be Edcouch-Elsa’s undoing and Edinburg Vela’s beginning to a 56-35 victory party at Richard R. Flores Stadium on Thursday night. After Vela tied the game at 35 on a touchdown pass from senior quarterback Nathan Garcia to junior wide receiver Ozzy Garcia, Edcouch-Elsa senior kick returner John Michael Gonzalez muffed a designed handoff to a teammate on the ensuing kickoff. The SaberCats pounced on the ball deep in Yellow Jackets territory and had no trouble cashing in six. The game may have turned for good on that special teams play in the fourth quarter, but Vela flipped the field on more than one occasion courtesy of junior returner Daniel Enriquez. Enriquez did as much early in the third quarter. With E-E up by eight, Enriquez scooped up a short punt and ran it 49 yards for a touchdown to push Vela’s deficit down to one at the 9:52 mark. 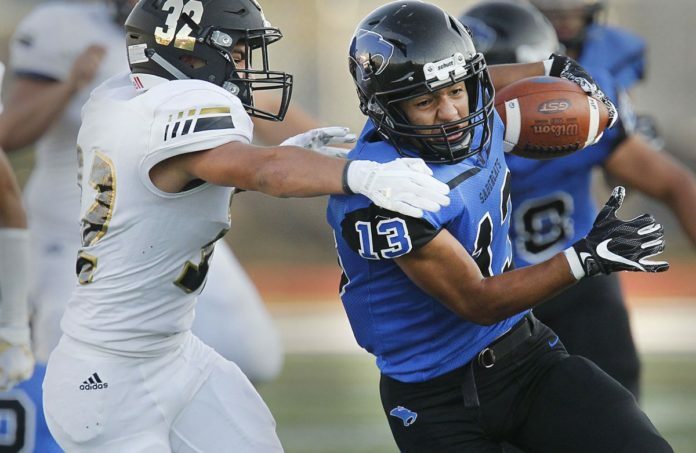 Later, with the SaberCats holding a seven-point lead, E-E’s Edwin Gallegos punted the ball 40 yards from his own 20-yard line only for Enriquez to return it 41 yards to E-E’s 19-yard line, setting up another Vela touchdown a few plays later. “That’s our first point of emphasis — the special teams unit,” Edinburg Vela coach John Campbell said. “I know that sounds cliché, but that’s something we believe in. We blocked a punt for a score last week. We scored on special teams this week, and we even got a turnover on one of our units. Vela junior quarterback Nathan Garcia had his own adversity to overcome after throwing his first interception of the season. The interception was returned for a touchdown by Edcouch-Elsa junior safety Derrick Ayala to give the Yellow Jackets a 22-14 lead heading into halftime. For the game, Garcia completed 9 of 19 passes for 157 yards with two touchdowns and the interception. He also ran for 54 yards and a touchdown. You can find live stats and play-by-play from the game here. Track all of the Week 2 games on the RGVSports.com live scoreboard. Monitor staff writer Nate Kotisso caught up with Vela coach John Campbell and Edcouch-Elsa coach Joe Marichalar before the game on The Monitor’s Facebook Live. GAME NOTES: Thursday’s meeting between the Yellow Jackets and the SaberCats is The Monitor’s Game of the Week. … Edcouch-Elsa broke into the top 10 after upsetting then-No. 6 Los Fresnos 24-21 in Week 1. … Friday marked the first varsity start for Yellow Jackets junior quarterback Albert Trevino, who threw a touchdown pass and ran for another. … Sophomore running back Jared de los Santos shined in his debut, as well, running for a touchdown and catching Trevino’s lone touchdown pass. … The SaberCats had very little trouble disposing of last season’s co-District 31-5A champion Laredo Nixon 34-13 in John Campbell’s Valley coaching debut last Friday night. … Senior quarterback Nathan Garcia led a balanced offensive effort, completing 10 of 18 passes for 117 yards and a touchdown. Vela also amassed 177 rushing yards and two touchdowns on 6.6 yards per carry. … The Yellow Jackets were responsible for the SaberCats’ lone regular season loss in 2016.